Environmental justice, and nonviolent resolutions to the destruction and consumption of land and resources, has always been an objective of our own visionary women. The clubwomen of GFWC first began expressing interest in conservation in 1896. By 1902, the Forestry Committee, the precursor to today’s Conservation Committee, was formed. Last week, at the annual Women’s History Month Reception, guest speaker Dr. Marci Reaven enlightened us about the preservation efforts of the New Jersey Federation and the battle for Palisades. We are delighted to continue the conversation by recounting the stories of clubs around the country who have resolved environmental conflicts within their own communities and had the vision to bring their hopes of ecological justice to life. Clubwomen, such as those that you’ll find in the articles below, were integral in the formation of the National Park Service. Clubs around the country advocated for the preservation of their community’s natural resources and landscapes. One of the most enduring conservation projects of GFWC Illinois is their partnership with Shawnee National Forest. In late 1933, GFWC Illinois contacted the Forest Service of the U.S. Department of Agriculture and suggested that the Federation establish a memorial forest. GFWC Illinois’ efforts led to the establishment of the second Federation forest in the country. The first cooperative forest planting project at Shawnee occurred in April 1934. By 1935, 160 acres had been planted. On October 6, 1936, a formal dedication was held for the first completed plantings. An agreement between the Forest Service and the Federation stated that for each $10 donated, an acre of seedlings would be planted. At this time significant flooding was occurring in the region, which highlighted the need for reforestation to control the water flow. The campaign “Lincoln Pennies for Lincoln Pines” generated $1,200 in contributions. In 1937, 1,107 gavels marked with the shield of the U.S. Forest Service were made by participants in the Civilian Conservation Corp for every district, club, and county federation. The gavels were a gift from GFWC to the Illinois Federation for donating more tree seedlings than any other state. 855 acres had been planted by this time. Plantings stopped in 1941 due to WWII, but in 1947, a new two-year agreement allowed plantings to resume at $10 per acre. This resulted in 1,000 new trees, which included planting, maintenance, and certificates to the donor. In 1949, donations in the amount of $2,900 were given for plantings at Shawnee, Sand Ridge, and a wildflower and bird sanctuary at Illinois Beach Park. In May 1963, members visited Shawnee for a ceremony dedicating a nature trail sponsored by GFWC Illinois. President Barnes cut the ribbon to open Rim Rock Trail at Pounds Hollow. It was the first nature trail financed by a woman’s organization in any national forest. The trail allowed the public to safely view and learn about archeological features and rare plants in the region. Later that day, Mrs. Barnes, who had donated the first dollar to the forest, planted the 3-millionth pine tree given by GFWC Illinois members. 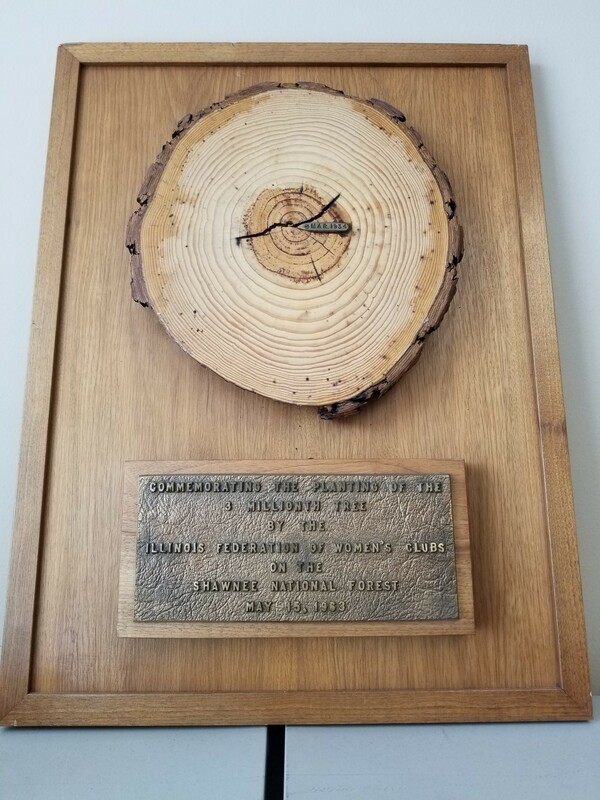 The plaque notes that the tree was originally planted in 1934, making it among the first in this partnership. From 2006–2019, GFWC Illinois has contributed over $12,000 to Shawnee National Forrest for seedling plantings. Reports received for 2018 indicate that members have embraced GFWC’s Grand Initiative pertaining to tree planting by supporting Shawnee National Forest. This continued support honors the members who long ago had the foresight to value majestic green spaces. In 1985 Marie Grover, member of the GFWC Manistique Women’s Club and local and district chair for (TAP) Touch America Project, along with the U.S. Forest Service, other organizations such as Job’s Daughters, 4-H, Girl Scouts and area businesses planted 10,000 tree seedlings in the Hiawatha National Forest. 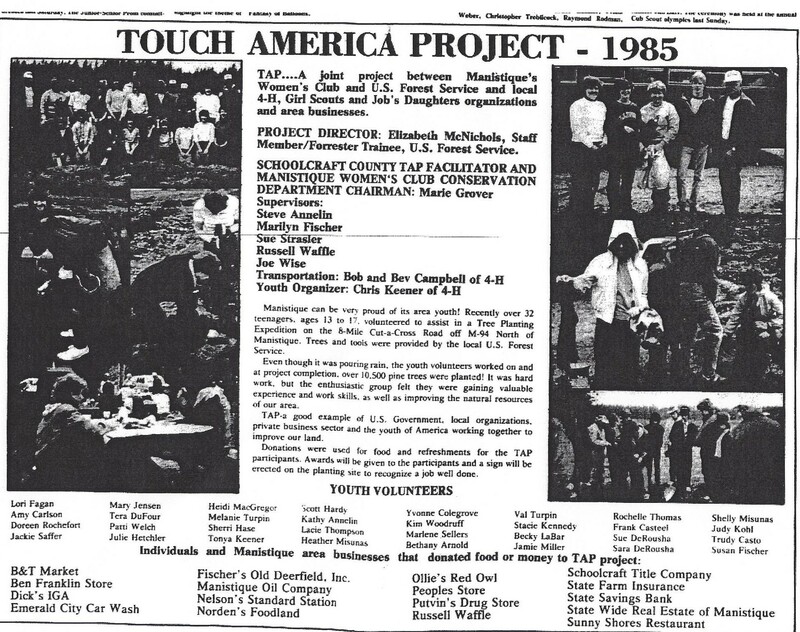 The Touch America Project effort was sponsored by the General Federated Women’s Clubs and encouraged young people to care for an maintain their local environment. Over 32 youths, aged between 13-17 years old, volunteered to assist in a tree planting expedition in Manistique, Michigan. Trees and tools were provided by the US Forest Service. Even though it poured rain, the youth volunteers worked on the project until completion. Over 10,500 pine trees were planted! Donations from businesses provided food and refreshments for the participants and a sign marking the project’s achievements was erected on the planting site. Last Spring, members of the Suburban Woman’s Club of Plains, visited Sandy Hook, New Jersey, with the sole purpose of making a difference. The clubwomen spent the day picking up trash at the National Park. The project had materialized because the club’s Conservation Committee had learned of an international beach cleanup called “Clean Swell” spearheaded by Ocean Conservancy. Ocean Conservancy helps formulate ocean policy at the federal and state government levels based on peer-reviewed science. They are one of the few organizations that help protect wildlife in the ocean. With Clean Swell, individuals and groups are asked to start collecting trash wherever they are around the world and track their progress. The collected data is then uploaded to Ocean Conservancy’s global ocean trash database. These data sets deliver a global snapshot of ocean trash and provide researchers and policy-makers insight to inform solutions. Every year, hundreds of thousands of volunteers comb lakes, rivers, and beaches around the world for trash. For over three decades, more than 12 million volunteers have collected over 220 million pounds of trash. When the Suburban Woman’s Club arrived at Sandy Hook National Park, Park Rangers met them and directed the women to Horseshoe Cove. 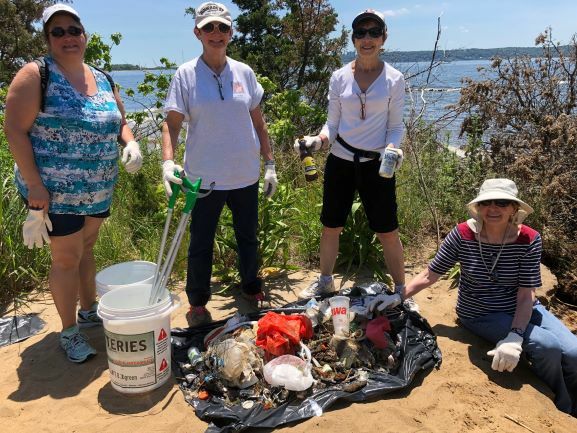 Despite the beach appearing to be in good condition, in less than two hours clubwomen managed to pick up over 32 pounds of trash. Of the items collected, almost half were made of plastic: bags, straws, forks, cups or lids, bottle caps, bottles, and items too small to identify. Results were tallied on the Ocean Trash Data Form and uploaded to the Ocean Conservancy website. These items found their way into oceans and onto beaches and can be ingested by wildlife. Over 100 million marine animals are killed each year due to plastic debris in the ocean. Currently, it is estimated that there are 100 million tons of plastic in oceans around the world. In addition to the beach clean-up, club members have been actively writing letters to local stores, restaurants, and elected officials to discourage single-use plastics like straws, plastic bags, and Styrofoam. Letters have also been directed at major food-chain restaurants like McDonald’s, Burger King, and Dunkin Donuts. Federation Forest State Park near Enumclaw, Washington exists today because of the work done by GFWC Washington State clubwomen 91 years ago. Within the boundaries of the 574-acre park are old-growth forests, traditional Muckleshoot summer camps, remnants of the Naches Trail, and the riparian ecosystem of the White River. Its short, flat interpretive trails make the park an ideal destination for family-friendly hiking. In the mid-1920s Jean Caithness Greenlees, a teacher at Everett High School, dreamed of preserving a section of lowland old-growth forest for use as a park. She had witnessed massive deforestation in her home state of Wisconsin and could see the same thing happening in Washington. Her goal was to ensure future generations could experience an ecosystem that was rapidly being wiped out. Greenlees presented her idea to Esther Maltby, 1925-27 GFWC Washington State President, who lent her support for the plan, and GFWC Washington launched the “Save a Tree” campaign in 1926. Clubs sold “Save a Tree” buttons for $1 each. For $100 donors could “buy a tree” to have a bronze plaque with their name placed on a tree in the park. Their goal of $25,000 was reached in two years, and a 62-acre stand of old-growth forest near Snoqualmie Pass was purchased. In 1928, GFWC Washington signed the deed to the property for the park over to Washington State Parks and Recreation Commission (WSPRC), beginning a more than 90 year partnership. The first park was dedicated in 1934. The name “Federation Forest” was chosen to honor the work of the GFWC Washington. Tragedy struck in 1938 when logging on adjacent property left the trees vulnerable to wind-throw; the park was condemned as a safety hazard and closed. It took several years to find a suitable location for the new park. With the help of state funding, the present-day location along the White River was chosen and the park opened to the public on July 16, 1949. Federation Forest features an interpretive center which was opened in 1964. The center was built with $89,000 from the estate of GFWC Washington clubwoman Catherine Montgomery; a founding faculty member at Western Washington University, conservationist, and avid hiker who is credited as being the first to envision the Pacific Crest Trail in 1926. Inside the center, visitors learn about the native Muckleshoot Indian Tribe and GFWC Washington through temporary exhibits installed in 2016. These exhibits were partially funded by over $10,000 given by GFWC Washington. Gardens featuring native plants surround the center. GFWC Washington paid for living quarters to be added to the center in 1968. 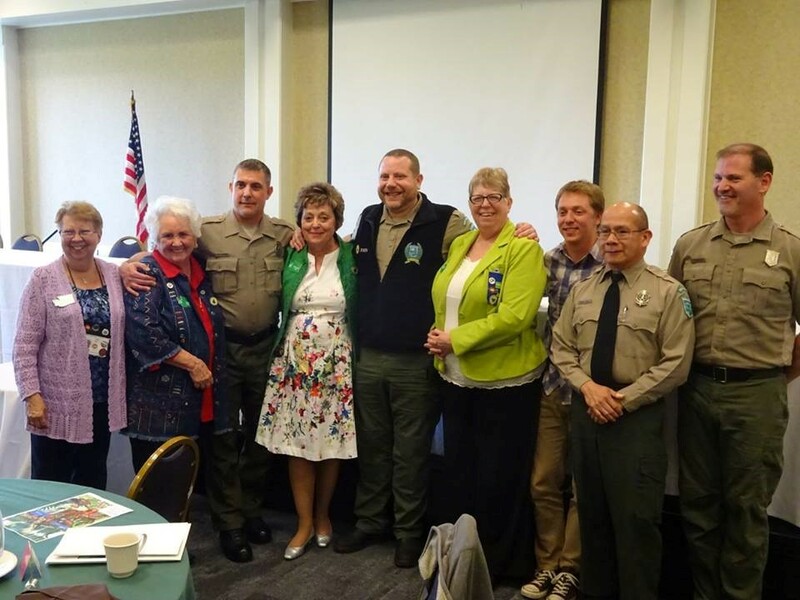 In 2014, GFWC Washington Federation Forest Committee members were invited to be part of a committee organized by WSPRC to plan for further updates to the Catherine Montgomery Interpretive Center. Clubwomen are currently working to include funding for the project into the Governor’s State Capital Budget. 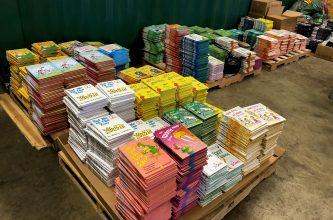 Throughout the years, GFWC Washington has donated significant funds for educational supplies, building and park maintenance equipment, and exhibit enhancements. A new save-a-tree pin campaign was launched in 2017. The proceeds of the pins going directly to the park, and every year clubwomen organize a cleanup day at the park. The Anderson Valley Unity Club in Boonville California is proud to have had a part in saving Hendy Grove in 1938. 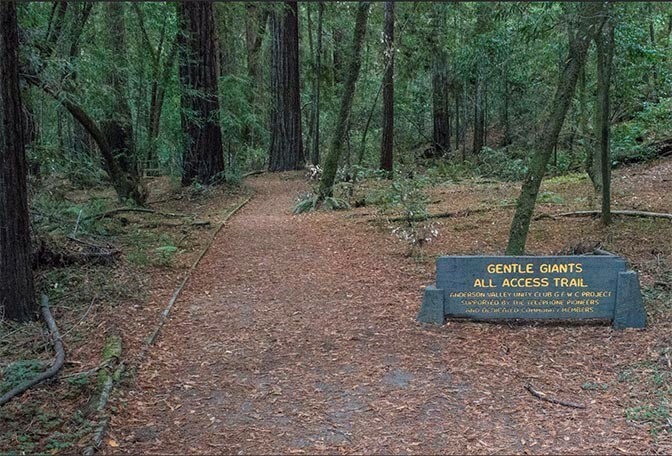 For years, local people had freely enjoyed this swath of Redwoods for quiet strolls, picnicking, and camping. However, the growth of the lumber industry brought fear that the trees would be sold and cut. Millie Brown, 1929–1930 Unity Club President, especially loved this grove. At the club’s first meeting in the fall of 1938, Millie introduced Mr. T. A. Strowbridge from San Rafael as a speaker. Mr. Strowbridge had begun coming to the Anderson Valley as a young man in 1898, and had advocated that Hendy Gove should be made a park. In his talk, he introduced the clubwomen to the work of the Save the Redwoods League. As a result of this meeting, many letters were written and officials were contacted. With the support from the County Federation, the Unity Club began their work to save Hendy Grove. The clubwomen continued their efforts undauntedly for many years. In 1941, Jessie McCarty asked that a group from the club meet with the Farm Center to urge that Hendy Grove be included in the State Park area. A committee consisting of Jessie McCarty, Alice Tindall, and Millie Brown, was appointed to attend to this matter. Thirty-five long years later Hendy Woods State Park was dedicated. For its part in the project to save Hendy Grove, the Unity Club received an award certificate from the California Federation of Women’s Club. May Austin Elizabeth Mann was born on April 25, 1872, and moved to Crystal River, Florida in 1874. In 1882, May’s mother died, but May nonetheless graduated high school as valedictorian. 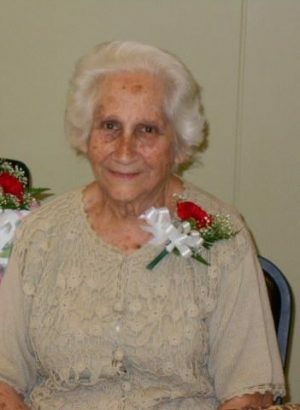 Though still a teenager, May served as her father’s aide and hostess in Tallahassee while he was State Representative, giving her a tremendous amount of inside knowledge of state politics. In 1891, she married Judge William Sherman Jennings, who with the help of May, would become Florida’s 18th Governor in 1901. At the end of his term, they moved to Jacksonville and May joined the Jacksonville Woman’s Club and the Springfield Improvement Association, members of the Florida Federation of Women’s Clubs (now GFWC Florida) and the General Federation of Women’s Clubs (GFWC). During her tenure with GFWC Florida, May considered Royal Palm Hammock, hoping to preserve this unique spot in the US where Royal palms were found growing naturally. Henry Flagler was moving his railroad toward the Keys, real estate development encroached, and the hammock was threatened with destruction by vandals and road crews. Minutes before the legislature adjourned in June 1915, the park bill was approved but without any funding. The 1,960 acres were deeded to GFWC Florida. Royal Palm State Park was the first state park established by the Florida Legislature and the first in the nation established by clubwomen. Florida’s clubwomen now had a park but no money to operate it. Jennings tackled the problem by writing to groups, news media, and wealthy notables such as John D. Rockefeller, Andrew Carnegie, and Thomas Edison. 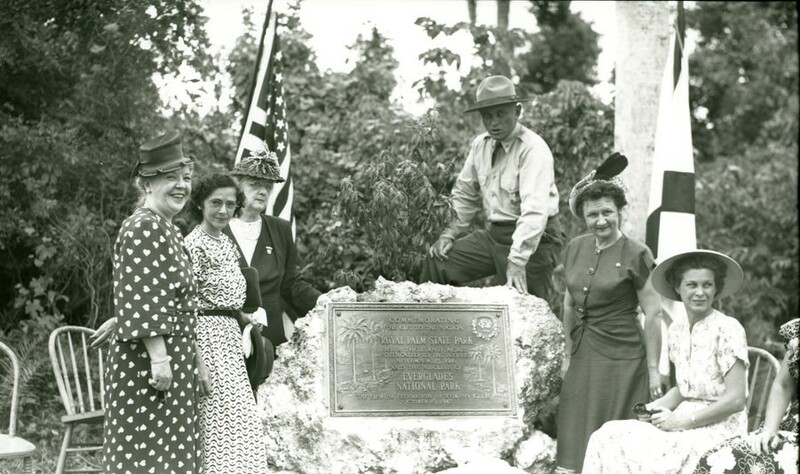 By 1929, the park had grown to 12,000 acres, and GFWC Florida offered to make the park part of a proposed national park. In 1934, the federal bill passed authorizing the park, but it took thirteen years to become reality. In the meantime, GFWC Florida continued to run Royal Palm which had more than 20,000 visitors annually. In addition to her work on Royal Palms Park, Jennings often worked with her son Bryan, on forestry matters. She was appointed in 1919 to a committee whose work became the Florida Forestry Association, as “special consultant on legislation,” something particularly notable because it was one year before women’s suffrage.